Metro Cash & Carry Ramzan leaflet is here with promotions, discounted prices and Ramzan Ration Packs details. 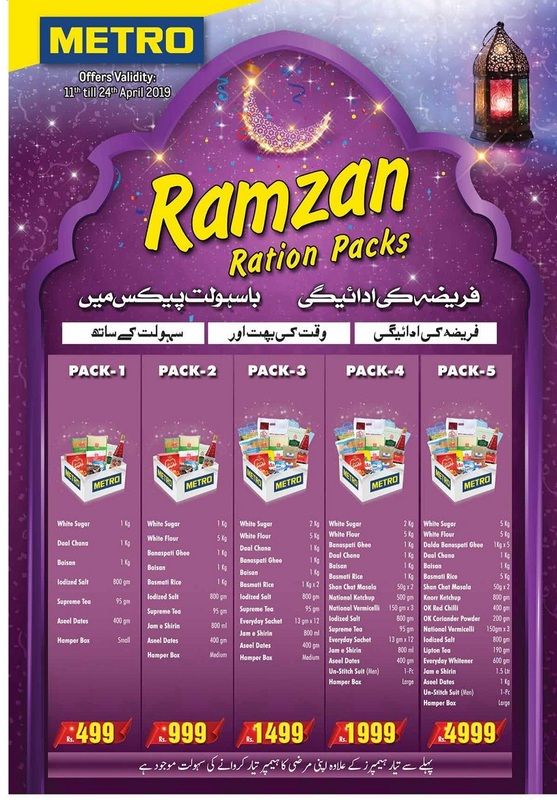 Ramzan Ration Pack price is starting from Rs.499 items includes 1kg white sugar, 1kg daal chana, 1kg baisan, 88gm lodized saltm 95gm supream tea, 400gm aseel dates. Shipping & Delivery: Rs. 200 SHIPPING. FREE SHIPPING on orders over Rs. 2000/-. Locations: Click here to locate Metro Cash & Carry. Catalogue: See Metro Cash & Carry latest catalogue here.